Andy Gilhooley's MGF pictured whilst raised up on a lift: front right wheel pictured. The inner edge of the tyre worn practically to the canvass on the right of the picture above. This tyre was replaced soon afterwards! Does this picture of Andrew Gilhooley's front tyre look worryingly familiar to you? If you are an MGF owner, then unfortunately, I suspect that to at least half of those reading this will suffer a cold shiver of familiarity. What is pictured opposite is the all too predictable sight of inner tyre edge wear that afflicts approximately 50% of MGFs at sometime in their early life. How can we be so sure of the 50% figure? From two sources: one, a BBS survey of MGF owners in 1999 (Thread: Tracking problems....Survey!! ), and second, a survey of cars in the MGF car park at the MG 75th anniversary celebrations at Silverstone '99*. Both surveys put the figure at around the 50% mark. MGTF owners can breath a sigh of relief here, as this is not a problem that severely effects this model - you lucky people! How does the problem present? Quite often, the owner is completely unaware of any problem at all. The wear is often picked up on incidental inspection- often at the first or second Rover service. Occasionally, the tyre wear can be associated with vibrations felt through the steering or through the suspension. This is likely to be attributable to a gross tracking alignment problem. 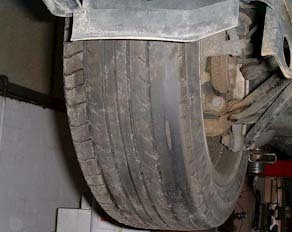 It is often suggested that the inner edge tyre wear is purely attributable to a low suspension ride height. Whilst this is undoubtedly a contributory factor, it is not the whole explanation. MG dealerships will none-the-less tow the 'official' line, and pump the suspension up for you in an often vain attempt to solve the problem- but quite often this work is unnecessary. What is the cause of inner edge tyre wear? Abnormal tyre wear is almost certainly down to incorrectly set tracking. Incorrect tracking can be caused by a change of ride height (hydragas suspension can settle over time or be deliberately tampered with), knocked by hitting a pot hole or simply having been set in error to start with. Getting your car properly tracked by an expert team for a typical cost of 40-50 quid will reap big rewards in terms of improved secure handling and reduced tyre replacement bills! The origins of the MGF's front tyre wear problems is a combination of geometry problems posed by engineering constraints and perceived safety. As standard, the MGF runs a significant castor and toe-out angles on the front wheels. The castor of the front wheel exacerbates camber changes as lock is wound on, and hence load upon the inner tyre edge of the outer wheel. The toe-out angle increases the angle of slip of the tyre, even when driving in a straight line, and this puts further pressure on the inner tyre tread contact patch with the road. If this is compounded by an extreme camber setting (the camber gets progressively more negative as the ride height is dropped) then the inner edge of the tyre is very rapidly worn away. Ensure that the ride height and the suspension geometry are within the manufacturer's specified ranges. By doing so, the tyre wear issue is unlikely to strike. Don't forget to get the car's drive axis checked (this is a measure of the subframe alignment). If tyre wear is persistent despite correct ride height and toe angles, alternative toe-angles could be considered: either parallel or even toe-in can be used (typical figures used are respectively, parallel: 0deg, 0 min +/- 4 min, and toe-in: 0 deg 5 min +/- 4 min). It should be noted that these are not recommended figures, and you may be asked to sign a disclaimer to waiver responsibility for the centre setting the tracking for you. On some cars the camber is incorrect at the ride height you prefer. This will always entail a greater risk of tyre wear. The only final way to put this problem to bed is with camber adjusters. Unfortunately, these are not currently available (May 2004) except for the rear suspension (see Mike Satur's website, image here: http://www.mikesatur.co.uk/images/trackcontrolarmrear.jpg) I am keeping a watching brief on this, and will post more news when available.